Spread across Bandera and Medina counties near San Antonio, TX, Lake Medina is an L-shaped reservoir with peaceful, clear water and abundant fishing. If you are looking for a relaxing place to vacation with your family or to reunite with old friends, rent a lake house on Medina Lake and get ready for an outstanding experience deep in the heart of Texas. Spread across Bandera and Medina counties near San Antonio, TX, Lake Medina is an L-shaped reservoir with peaceful, clear water and abundant fishing. If you’re looking for a relaxing place to vacation with your family or to reunite with old friends, rent a lake house on Medina Lake and get ready for an outstanding experience deep in the heart of Texas. The best part of renting a Lake Medina lake house is the ambiance. When you book a lake house that is right on the shore, it’s like a wonderful slice of liquid blue heaven is in your backyard. Nothing is more peaceful than the view of gentle waves lapping the shore, stirred by a welcome breeze. If your goal is to get away from it all and relax, you could watch the sunrise reflected in the still lake waters from the deck of your lake house, or lay in a hammock and let the lapping of the waves lull you to sleep. You could gather your fishing gear and pick a tributary to explore. Or you could rent a kayak and skim across the 5,000 acres of water, then wander the shore and look for wildlife. And when you’re done with your day of lake enjoyment, you can head inside your Medina Lake lake house and cook up your favorite meal, watch some TV, and head for bed in spacious and comfortable accommodations. There are lots of ways to enjoy Lake Medina. If you prefer motorized craft, they are permitted here. If you want to go au naturel, swimming, tubing, canoeing, and kayaking are great options. 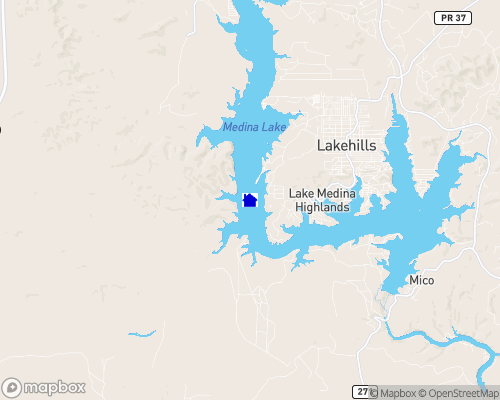 And Medina Lake is an exceptional fishing destination. The lake is periodically restocked to ensure excellent populations of largemouth, white, and hybrid striped bass and channel, blue, and flathead catfish. Coves, tributaries, and rocky outcrops are abundant, so you can explore a new fishing spot each day. And if you visit Lake Medina In September, you’ll get to enjoy the annual Cajun Festival, which turns the lake into a mecca for residents and visitors alike seeking excellent food and a great party! Depending on which part of this massive lake hosts your lake house, you’ll find many other attractions that might entice you away from your lake haven for the day. For example, if you are on the northwest side of the lake, near Bandera, you might visit the Frontier Times Museum, which displays Indian and cowboy artifacts that tell the story of the Old West. This hometown museum has a great dose of local flavor and fun that is a must-see for history buffs. And if you are fond of historic items, you can find some to buy at Western Trail Antiques. This massive indoor antique mall has an impressive collection that is sure to keep you browsing for hours! Finally, you can round out your Western experience by visiting Juniper Hill Stables to go horseback riding through Texas Hill Country. This is a visitor favorite, where customers are treated like family, and the trail experience is unmatched. If you are on the Southeast side of the lake, you might head over to San Antonio and see some of the city’s best offerings. San Antonio is packed with historic sites like the Alamo, Mission San Jose, and the King William Historic District. It is also a hotspot for the arts, with attractions such as the Majestic Theater, McNay Art Museum, and the San Antonio Botanical Garden. You can get your fill of thrills at SeaWorld and Six Flags Fiesta Texas, or enjoy shopping and dining along the San Antonio River Walk. No matter which part of Medina Lake you settle on, you are sure to enjoy the atmosphere of lake house living. And being surrounded by some of the very best that Texas has to offer, both historic and contemporary, makes Lake Medina a memorable place to rent a lake house.